The problem rotor’s movement in a stationary circular cylindrical chamber having finite length and filled with viscous gas is solved by the method of direct numerical integration of the set of equations describing pressure distribution in a thin layer of viscous gas and the motion of a rotating statically disbalansed cylinder. The rotor moving in the gravitational field is influenced by the impressed forces which vary periodically in time. Unsteady pressure equation is approximated by the symmetric stable finite-difference scheme of the second order accuracy. Stability criteria of a rotating rigid unstable cylinder (a rotor) motion subject to problem parameters are studied. The inner cylinder is influenced by outer forces which vary periodically in time. Trajectories of the rotor stationary motion for various velocities of rotation, disbalance values, amplitudes and frequencies of outer forces are calculated. Conditions of contact free motion of the cylinder, rotating in the chamber, are determined. This paper considers one-dimensional heat transfer in a media with temperature-dependent thermal conductivity. To model the transient behavior of the system, we solve numerically the one-dimensional unsteady heat conduction equation with certain initial and boundary conditions. Contrary to the traditional approach, when the equation is first discretized in space and then in time, we first discretize the equation in time, whereby a sequence of nonlinear two-point boundary value problems is obtained. To carry out the time-discretization, we use the implicit Euler scheme. The second spatial derivative of the temperature is a nonlinear function of the temperature and the temperature gradient. We derive expressions for the partial derivatives of this nonlinear function. They are needed for the implementation of the Newton method. Then, we apply the finite difference method and solve the obtained nonlinear systems by Newton method. The approach is tested on real physical data for the dependence of the thermal conductivity on temperature in semiconductors. A MATLAB code is presented. Mathematical models of crystallization of binary metal alloys crystallizing in the temperature range are proposed. These models are intended for use in the composition of quality control systems for cast alloys based on computer thermal analysis. 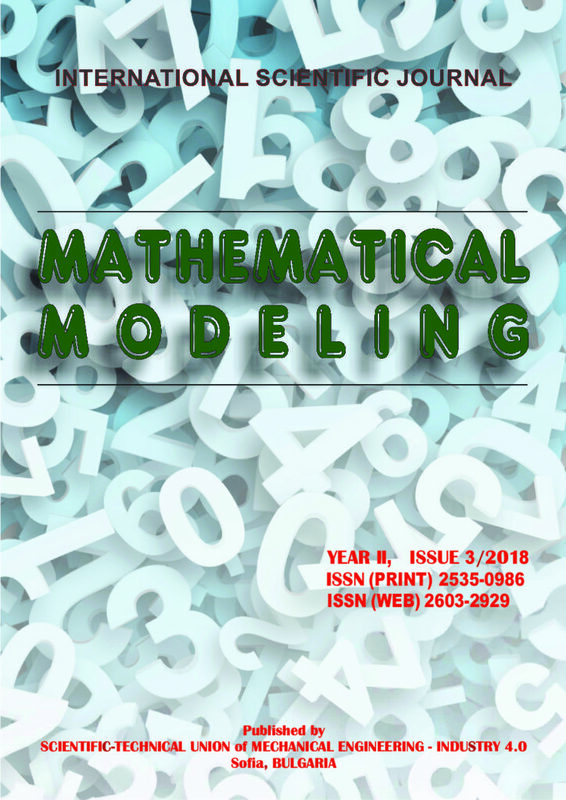 The proposed models make it possible to calculate the time dependences of the relative amounts of the solid and liquid phases using the data of the cooling curve, as well as to determine the intensity of the increase of the amount of the solid phase. The method of determining the temperature dependences of the specific heat and latent crystallization heat using the data on the temperature-concentration dependences of the free energies of the phases forming the system under study was used. The magnetomechanical hysteresis models of Jiles-Atherton and its modifications by Sablik are extended to treat magnetic properties in the case of triaxial stress state. Unlike the previous version, it is focused on weak magnetic fields. Results of simulation are compared with experimental data. Thanks to its unique properties piezoceramics has applications in various fields of engineering and technology. Disk piezoelectric devices are widely used in the elements of information systems. Mathematical model of piezoceramic disk transformer with ring electrode in primary electrical circuit is constructed. An estimate is obtained and calculated and experimental curves of the frequency dependence of the modulus of transformation coefficient of piezoceramic disk transformer with ring electrode in primary electrical circuit are compared in the work. As a result of research of real device’s mathematical model a set of geometrical, physical and mechanical and electrical parameters of a real object can be determined which provides realization of technical parameters of piezoelectric functional element specified in technical specifications. The cost of the saved resources is the commercial price of the mathematical model. Modern technologies are a part of contemporary life, and they have been part of the educational process in Bulgarian schools for a while. There is no doubt that computer competencies are a necessity, and therefore they are taught as a separate subject at school. However, the use of Information and Communication Technologies (ICT) resources is not limited only to this dedicated subject, these tools also support teaching all other matters. They are used during each stage of school education as well. For exploring the implementations of ICT in an educational environment, an online-based survey aimed at students and teachers was conducted. This paper presents a comparison of the frequency of use of ICT in Bulgarian schools according to different educational stages and subjects with the focus on the humanitarian ones. The current research shows the statistical analysis of the data and a comparison between the answers of students and teachers. Markovian models are often used in modelling a time development of random phenomena. When modelling real world scenarios it is reasonable to assume that the respective phenomena may not be time homogeneous. Based on the sociological and security research, it can be assumed that there is a link between a destabilisation of a society of a given geographical region and the acts of terrorism. This link is utilised in construction of a model for description of the intensity of a terrorist threat based on given determinants/indicators of societal stability. The model is based on the theory of discrete non-homogeneous Markov chains. The theory of generalised linear models (GLMs) is used in the estimation of the probabilities of the categorised level of the terrorist threat. In the contribution the use of different estimates of the categorised level of terrorist threat probabilities is studied. The estimates are determined by GLMs with different input parameters. The influence of the resulting estimate on the transition matrix of the non-homogeneous Markov chain is assessed. Additionally, a real world example utilising the data from Global Terrorism Database of University of Maryland and Organisation for Economical Cooperation and Development is presented. Protein classification is among the main themes in bioinformatics, for the reason that it helps understand the protein molecules. By classifying the protein structures, the evolutionary relations between them can be discovered. The knowledge for protein structures and the functions that they might have could be used to regulate the processes in organisms, which is made by developing medications for different diseases. In the literature, plethora of methods for protein classification are offered, including manual, automatic or semiautomatic methods. The manual methods are considered as precise, but their main problem is that they are time consuming, hence by using them a large number of protein structures stay uncategorized. Therefore, the researchers intensively work on developing methods that would afford classification of protein structures in automatic way with acceptable precision. In this paper, we propose an approach for classifying protein structures. Our protein voxel-based descriptor is used to describe the features of protein structures. For classification of unclassified protein structures, we use a k nearest neighbors classifier based on fuzzy logic. For evaluation, we use knowledge for the classification of protein structures in the SCOP database. We provide some results from the evaluation of our approach. The results show that the proposed approach provide accurate classification of protein structures with reasonable speed.